Apr. 5, 2013 12:00 p.m.
With an attractive coat of white and black, this curly yearling shows off his curls very nicely. Sunnybrook, Leduc County – When she was a little child living in an urban world, Deanna Johnson (now Deanna Jean) dreamed of horses. It was her passion; her family knew that any horse-themed gift or activity would be a hit for this intense, cheerful child. She lived a full life, eventually established a career in accounting now at the Thorsby Farm Center. Since she had begun to give riding lessons to children at the Pony Club in 1985, Deanna noticed that many kids –and their parents- had serious allergies. She was introduced to, and fell in love with the rare breed of “Curlies”: a breed that is hypo-allergenic, a precious quality for a horse and an ideal option for horse-lovers with allergies! Deanna, a fit, curly-haired blonde and outgoing lady, created Sunnybrook Stables, where she continued to give riding lessons in several styles, including dressage and proceeded to increase her herd. With a sweet disposition, the “North-American Curlies” have a coat that supports their breed name; it is soft but intensely curly, with a mane that has ringlets to match. The inside of their ears is also curly: even their eyelashes are curly, compared to other breeds’ straight eyelashes. Black and white, pure white and tan are common colors for this extraordinary breed. Some have blue eyes that go well with their quiet and friendly nature. In the late 40s, in the midst of an historic snowstorm, a Nevada horse farmer by the name of Damele saw wild horses with a curly mane and coat. He captured a few, bred them and officially started a new equine breed. The first Curly in Canada was ‘snared’ by a white man who in fact stole it from the Indians’ trap. What started as a farm hobby for Deanna Jean, this “dream come true’ became an intense labor of love and an official Eco-Tourism business. Not only would Deanna open her doors to international visitors, rural neighbors, elderly groups and school children, but a natural progression was to breed these horses and export them. When she started Sunnybrook Stables in 1988, there were several Curly breeders and exporters in Canada: today, only three good-size commercial farms of this nature remain in the country. Sunnybrook Stables was a vital and successful gem of Alberta Tourism for nearly fifteen years. Deanna has travelled to countless horse shows all over the world, and has showcased her horses at Western Canadian exhibition events. 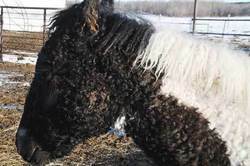 She added the Gypsy Vanner breed to her Curly herd when she purchased her first Gypsy mare Sally in Ireland. That mare is now a matriarch at the Sunnybrook Stables. A unique feature is that as they get older, Gypsies develop a sizeable moustache on their upper lip. Interestingly, an accidental coupling created the first Curly-Gypsy colt on Deanna’s farm. With their hooves covered in long hair, their thick coats and long manes only slightly curly, these are not a recognised breed (yet) but they are sweet-natured, beautiful and an exotic-looking horse. Another breed that joined Sunnybrook Stables was the “Missouri Fox-Trotter”, a tall horse with a sleek coat that caught Deanna’s attention when she attended a horse show in the US. Most of the horses on this farm have a real friendly disposition, and Deanna was happy to explain that not only her daily attention and work with the horses, but also their involvement in public events has created this enviable disposition. Every year, she takes several horses to the Parade of the Breeds, a popular event at the Calgary Stampede. These horses are also the lucky recipients of their owner’s special training. To be better equipped to deal with her horses and their breeding program, Deanna worked hard for several years at a training that eventually got her certified as an “Equine-Assisted Psycho-therapist”. This helps her deal with various equine dispositions, and it certainly shows in her herd! Sunnybrook Stables has now exported thirty (yes, 30!) horses to various countries of the world. A few years ago, Deanna met her knight in shining armor: Roland Jean was an urban man who adapted quickly to the busy country life that kept his bride happy for so long. On the Sunnybrook property where she had lived for many years, Deanna and Roland built their dream home, a magnificent log home they designed together. Deanna Jean is a woman who knows how to drive a bobcat, lay tile, design blue prints, break a horse, landscape – and much more! The unique Curly horse is creating a new dream for Deanna and Roland: a very tall Curly has joined their equine family, and his physique and disposition has encouraged its owners to train him to become a jumper. Dreams of Canadian competitions and Olympic glory are now in the horizon for this hard-working couple. Not content with this fabulous accomplishment in life, Deanna is also a passionate musician, a talent and hobby she shares with her husband; they both love playing the guitar, collecting beautiful instruments and constantly developing their musical skills. Deanna is now learning the violin, and she is proud of another skill she acquired a few years ago: she learned to design websites and has designed her own, www.sunnybrookstables.com. She has placed there thousands of photographs, and it is quite a site to visit and enjoy! As an animal lover herself, Deanna has a heart for those who cannot enjoy and own animals due to allergies. She has now added one more hypo-allergenic pet to her family: the Siberian Forest cats, also called the “Kravchenko Cats” are a long-hair, large bodied, extremely affectionate and loyal, with an interactive behavior resembling that of a dog. Www.siberiancats.com is an attractive and informative website. From the late ‘80s promoting Agricultural Diversification, things have certainly developed here in Alberta’s farming industry… Organic products and markets, bee products and plant exports, Curlies, Elk and other unique breeds have become acceptable and viable options on Alberta farms: this province is rich in opportunities and interesting lifestyles. Sunnybrook Stables and its owners are the proof that with hard work and a clear vision, dreams can come true!